With Kurt Vonnegut, every book you read will be excellent. There was just one that I felt like I had to work my way through, and that was his first, Player Piano. I admit that there are a few I haven't read yet, and I haven't read them because they aren't as highly recommended. But still, even when the plot was tough, his writing style is awesome. I have two favorites. The first is Cat's Cradle. It's a story about the atomic bomb. It's a story of Ice-nine. It's a story of the end of the world. It's the story of a religion called Bokononism, which makes a hell of a lot more sense than Christianity. 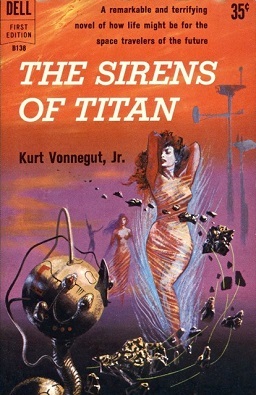 My other favorite is The Sirens of Titan. There are ghosts. There are space explorers. There is time travel. There were points in which I wasn't sure what was going on at all. But in the end, it didn't really matter. Here's why. Kurt Vonnegut is a science fiction writer. And yet, nothing he writes ever feels like a science fiction story. While most sci fi writers write about sci fi stuff and tie them into larger human themes, Vonnegut is all about the themes with a bit of sci fi to get the plot moving along. Every time I sit down to write, I want to have as unique of a voice as Vonnegut's. And perhaps that's my problem and why I don't get far.